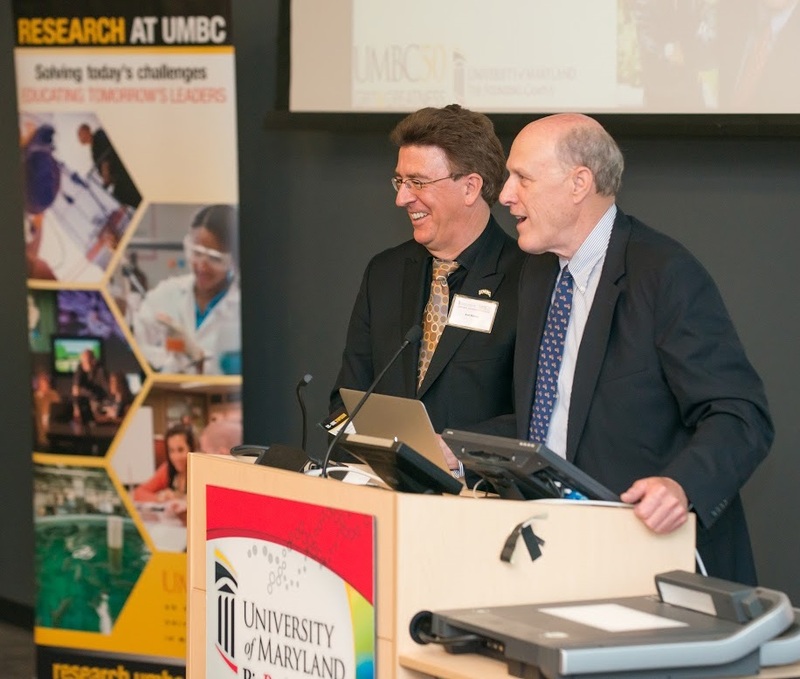 UMBC and the University of Maryland, Baltimore (UMB) celebrated new and recent recipients of UMB-UMBC Research and Innovation Partnership Grants at a symposium held last month on UMB’s downtown Baltimore campus. This annual event seeks to actively support the growth of meaningful and sustainable research collaborations between the two universities. 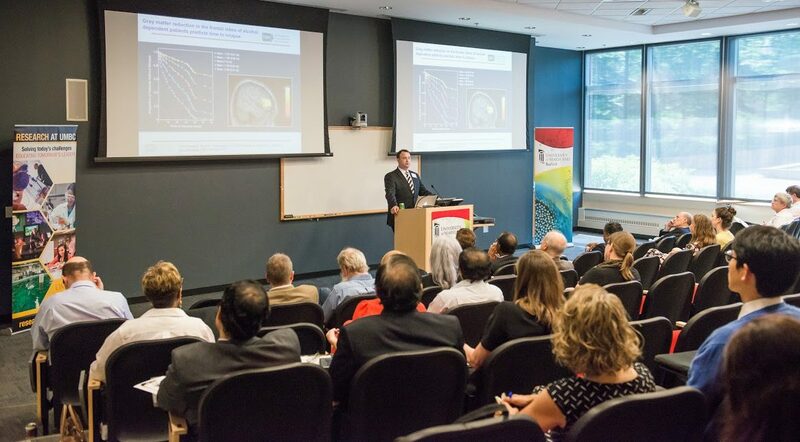 The June 2016 symposium highlighted the milestones of past partnership grant recipients and celebrated a new round of awardees: five teams of two, with faculty from all three colleges at UMBC as well as UMB’s School of Medicine, School of Pharmacy, School of Dentistry, and School of Social Work. Aaron White, senior scientific advisor to the director at the National Institutes of Health-National Institute on Alcohol Abuse and Alcoholism (NIH-NIAAA), delivered a keynote focused on the diagnosis, prevention, and treatment of alcohol addiction. In addition to having a major negative impact on so many lives, White noted, alcohol addiction costs the U.S. nearly $250 billion dollars each year. Following White’s remarks, the 2014-15 Research and Innovation Partnership Seed Grant teams each presented updates on their work, including goals for the upcoming year. Toni Antalis, professor of physiology at the UMB School of Medicine; Rajabrata Sarkar, professor of surgery at UMB School of Medicine; and Zeev Rosenzweig, professor of chemistry and biochemistry at UMBC collaborated to develop a targeted therapy that increases blood flow to the limbs of patients with artery blockages resulting from diabetes, stroke, or other causes. With the prevalence of diabetes rising dramatically in this country, it’s critical to find ways to prevent the need for last-resort treatments like amputation. When an artery experiences blockage, the nearby arteries expand to compensate, a process called “arteriogenesis.” When a specific protein called “p53” is deleted, the arteriogenesis response is stronger. However, p53 is also a critical tumor suppressor, so deleting it throughout the entire body or for an extended period of time is dangerous. The team is developing a new technique using nanoparticles to carry a drug that blocks p53 to carefully targeted immune cells, which pick up the particles and deliver the drug where it is needed. The team has shown that the new therapy effectively reduces p53 activity and increases arteriogenesis, which is maintained after treatment stops after 14 days. Aryya Gangopadhyay, professor and chair of the department of information systems; Nirmalya Roy, assistant professor of information systems; and Elizabeth Galik, associate professor in UMB’s School of Nursing; have developed and implemented a smart health technology for people with Alzheimer’s or symptoms of the disease. The technology monitors the cognitive impairment of older adults to help them maintain independence. They worked with a senior community center to fit some residents with wearable sensors to assess cognitive function by monitoring everyday activities like making a sandwich, sweeping the floor, washing hands, and folding clothes. Radi Masri, associate professor of endodontics, prosthodontics and operative dentistry at the UMB School of Dentistry; David Seminowicz, assistant professor of neural and pain sciences at the UMB School of Dentistry; and Raimi Quiton, assistant professor of psychology at UMBC, are working together to elucidate pain processing in migraines, the third most common cause of pain in the U.S. They hope to discover neural pathways that could be new targets for treatment, because current treatments are ineffective for a large percentage of migraine sufferers. The team showed that a brain area known as the superior colliculus could be involved in processing migraine pain. The superior colliculus is known to integrate many types of sensory information, which might help explain symptoms such as sensitivity to light, sound, and touch. They also found that individuals who experience migraines have chronically high levels of a protein that is known to transmit pain signals. One next step for their research is to see how mice respond to pain stimuli if the neural signal is prevented from passing through the superior colliculus. The final presentation examined how drugs are evaluated to develop a more effective way to test the effects of drugs on different cells simultaneously. To assess their new testing method, Ronghui Ma, associate professor of mechanical engineering; Liang Zhu, professor of mechanical engineering, and Hongbing Wong, professor in UMB’s School of Pharmacy, developed a specialized 3D-printed plate with multiple chambers. The 2016-17 grant winners span several several departments and centers at UMBC and schools at UMB. On the “challenge track,” Xudong Ge, UMBC Center for Advanced Sensor Technology (CAST), and Richard Pierson, UMB School of Medicine, will pursue development of a non-invasive respiratory status monitor. Chris Geddes, UMBC chemistry and biochemistry and Institute of Fluorescence, and Colin Stine, UMB School of Medicine, will work on the ultra-rapid and sensitive detection of cholera. “Seed track” winners include Elsa Garcin, UMBC chemistry and biochemistry, with Patrick Wintrode, UMB School of Pharmacy; Soobum Lee, UMBC mechanical engineering, with Mary Melo, UMB School of Dentistry; and Christine Mair, UMBC sociology and anthropology, with Amanda Lehning, UMB School of Social Work. UMBC President Freeman Hrabowski and UMB Chief Academic and Research Officer Bruce Jarrell offered closing remarks focused on their shared commitment to building a close relationship between the two universities for years to come. UMB and UMBC have complementary strengths, Pres. Hrabowski explained. Programs like the UMB-UMBC Partnership Grants, he said, help both universities fulfill their potential as national leaders in innovative research and teaching. Header image: 2016-17 UMB-UMBC Partnership Grant winners, from left to right: Amanda Lehning, Christine Mair, Chris Geddes, Colin Stine, Mary Melo, Soobum Lee, Xudong Ge. Top image: Andrew White gives his keynote address. Bottom image: Karl Steiner (left) and Bruce Jarrell introduce the program. All photos by Marlayna Demond ’11 for UMBC.